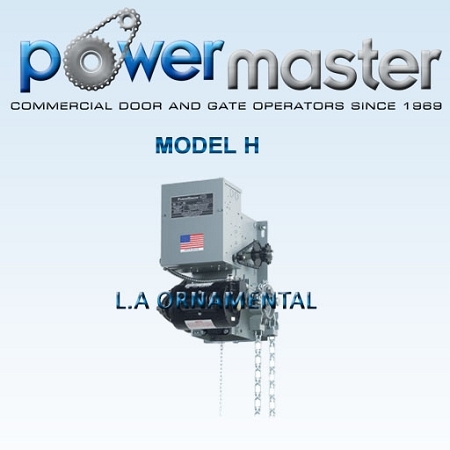 PowerMaster Model H operators are designed for use on Standard Lift Sectional Doors and Rolling Service Doors and Grilles. 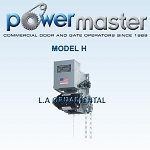 Supply PowerMaster H-71, 3/4 HP, 115V , 1 Phase industrial duty hoist type operator. Primary reduction shall be by heavy duty VBelt Drive. Secondary reduction shall be a chain and sprocket arrangement. Reduction stages shall be arranged so that mechanism is self locking when torque is applied at output shaft. All reduction shafts shall be a minimum of 1" in diameter, supported by bronze oilite bearings. Operator shall provide an adjustable torque limiting clutch. Motor shall be of the high starting torque, continuous duty industrial type, protected from overload by a current sensing or thermal type overload device. Motor controller shall be a heavy duty, full voltage, magnetic reversing contactor, that is mechanically and electrically interlocked. Electrical components shall be installed in a NEMA 1 enclosure integral to the operator. A transformer shall be provided to reduce control voltage to 24 VAC. Separate terminal strips shall be provided for connection of power supply line and all control devices. Operator shall be wired for an open/close/stop control station.